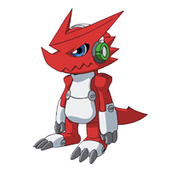 Shoutmon is the Partner Digimon of Kudou Taiki in Digimon Xros Wars. Shoutmon is extremely rambunctious and has a great sense of justice. He'll do almost anything to protect his friends even at the cost of endangering his own life. He aspires to become the Digimon King, a just sovereign of the entire Digital World. However, he has a tendency to act selfishly and impulsively, and takes a while to understand that being King would take more than just beating things over the head with his microphone. 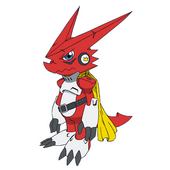 Shoutmon appears as Taiki's partner in a special mission available after completing the main storyline of the game. He and Taiki act as uncontrolled members of your party in the special dungeon. Shoutmon appears in the Super Digica Taisen card game. This page was last modified on 25 January 2019, at 05:54.